Deliberations collects juror art, as you may know -- drawings and photographs made by real people on jury duty, gathered in what we cheerfully call the "American Gallery of Juror Art." The collection is meant to show both the light side of jury duty and also the often-missed depth and talent of many jurors. Much of the work is extraordinary. A story like this, though, can't just go in the collection. You have to read the whole thing, but the short version is that artist Alberto Araoz, a 64-year-old Cuban immigrant, sat as a juror in a California murder trial where the victim was a four-year-old girl. When it was over, he went home and painted the little girl's portrait -- beautifully. Six months after the trial, he gave the finished painting to her grieving grandparents. I've been reading a lot of "jury duty" tweets on Twitter lately, and feeling a little discouraged at the frustration, boredom, and alienation that many people express. It was awfully good to see this article. Deliberations’ American Gallery of Juror Art went a little viral last week, after it turned up in Boing Boing (“a directory of wonderful things”). Several bloggers picked it up from there, including Robert Ambrogi in Legal Blog Watch, and it popped up periodically on Twitter all week. It’s actually unusual for John Borstel to make pictures of other people. “I like to take pictures of myself,” is how he describes his work, but his images aren’t self-portraits as most people think of them. In the themed “portfolios” on his web site, his body is more medium than subject -- variously costumed, placed, lit, obscured, and sometimes contorted as he uses it to explore ideas. This is challenging and sometimes disturbing work, with an unflinching willingness to follow where thoughts lead. His Flickr photostream contains other examples, and some remarkable travel photography as well. John Borstel wasn’t picked for a jury, which seems like a shame. Not only would he bring a wide life experience to the jury room (his bio says he has been “a puppetmaker, the art director of two veterinary journals, and a singing usher”), but his current work is rich in both the individual judgment and the collaborative skill that jury service requires. In his photography, as he says, "I usually work alone. That means I function as model, photographer, and viewer, all at once." But in his work as Humanities Director for the Liz Lerman Dance Exchange, his main focus is collaboration. He is co-author and illustrator of Liz Lerman's Critical Response Process: A Guide for Getting Feedback on Anything You Make from Dance to Dessert, a book describing Ms. Lerman’s “multi-step, group system for giving and receiving useful feedback on creative processes and artistic works-in-progress.” He also authors the Critical Conditions blog, focused on “the practice of critique” and the Critical Response Process in particular. The main steps of the process are described here, and it wouldn’t need much adjusting to make a fine template for jury deliberations. All rights in this drawing belong to John Borstel. Many thanks to him for allowing it to be shown here. I enjoy exploring every aspect, from its well known avenues to its hidden corners. I am especially drawn to capturing the elements of the city that never change. The buildings, the parks, the streets ... the city that we inhabit every day but often walk by without seeing. Like many juror artists, Laurie Ballesteros has to make room for art in her life. She's a middle school choir teacher, which would give her the right to do nothing but watch TV at the end of the day. 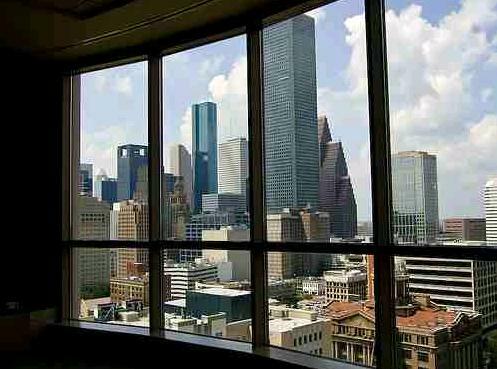 Instead, she takes pictures -- or heads for the computer, where she administers a web site called Houston Photobloggers, runs a Flickr group with over 250 members called "Assignment: Houston," and most importantly maintains the photoblog Photine, where her lovely images can be seen and also purchased. She has a wonderful eye not only for the urban landscape, but also for found still life (like these clarinets), color (this thread display), flowers (this bottle brush), everything. Her work gives you the idea that the world is considerably more beautiful than you thought it was. All rights in this image belong to Laurie Ballesteros. Thanks to her for allowing it to be reprinted here and in the American Gallery of Juror Art. If you're a portrait artist like James Mundie, jury duty is a great place to draw, because people hold still for so long. "I draw constantly," Mundie wrote to me, "but I'm trying to be more disciplined about making a regular practice of using my sketchbook. Sketching helps keep my drawing skills honed, but also loosens me up and helps me to become more efficient in describing form. Just the act of drawing something -- really observing it --- helps me to focus and relax. It's like meditation." James Mundie's work seems to map the path from here to fantasy. On his web site mundieart.com, there are intricate drawings and prints; some are the ordinary faces around us, and others are the creatures and scenes of dreams. At another site called Prodigies, Mundie displays his "portraits of 'anomalous humans' -- sometimes called 'monstrosities' or 'freaks' -- in contexts borrowed from artworks of centuries past." At first you think these are historical drawings, and realizing that they're not pulls you in to what Mundie has drawn and your own reactions to it. "It is my hope that these images compel the viewer to linger and consider their own inhibitions and conceptions in relation to a subject which many consider taboo," he says. If that weren't enough, the black and white photographs in Mundie's Flickr photostream are full of a sense of light and scene, like the photo he took from that same seat in the pub after jury duty. The American Gallery of Juror Art is proud to welcome James Mundie. All rights in these drawings are his; thanks to him for allowing them to be reprinted here. 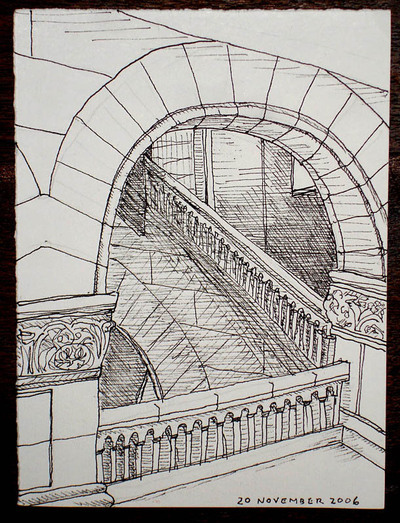 So I'm checking Flickr for juror art, as I periodically do, and there's my old familiar Milwaukee County Courthouse. Built in 1931, it's not everyone's idea of a picture-postcard courthouse; Wikipedia says Frank Lloyd Wright once called it a "million-dollar rockpile." But I love its echoing stone corridors, its soaring ceilings, and and its 24 then-modern murals of "the virtues," one in each of the original courtrooms, painted for the building by Wisconsin native Francis Bradford and financed by the WPA as part of the New Deal. The pictures on Flickr weren't of the building's exterior or of the Bradford murals. 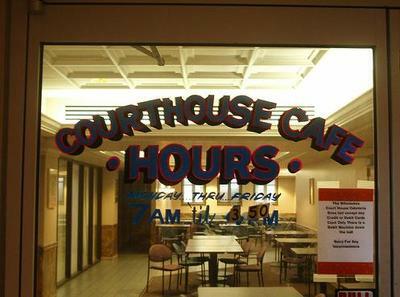 Instead, they were interior details, recorded with wit and warmth by a Milwaukee County juror who blogs as BB. That's about all she'll let me say: ""I'm BB, I'm a Web Information Architect at Hanson Dodge Creative here in Milwaukee, and my blog is BB-Blog at http://bblinks.blogspot.com." But I'll gladly publish an anonymous artist if it lets me give you a little tour of my home courthouse. Here's the door to the basement cafeteria. BB says, "I love the old hand-painted signage," and so do I. 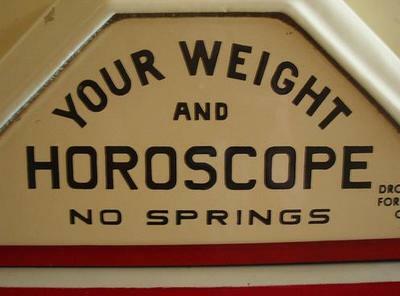 Then "[t]here are these weight & horoscope machines everywhere at the Milwaukee County Courthouse," says BB. "I wonder what the story is behind them...?" Me too. And here's the way the rooms are marked, and a look at a typically beautiful vaulted hallway. BB liked this one for the room number, and quoted 1984: "'You asked me once,' said O'Brien, 'what was in Room 101. I told you that you knew the answer already. Everyone knows it. The thing that is in Room 101 is the worst thing in the world.'" And of course for some people, this one probably is. See more of BB's work at her Flickr photostream and at BB-Blog, and see more juror art in the American Gallery of Juror Art. All rights in these photos belong to BB; thanks to her for letting me use them here. Civil Judge A.J. 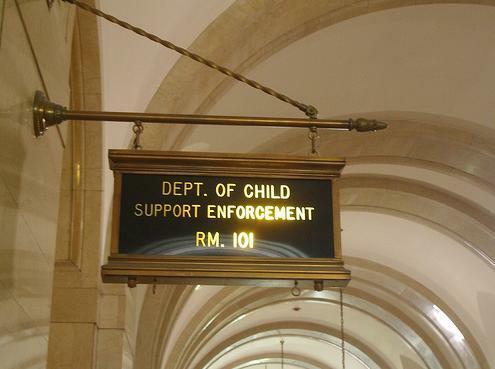 Hedding did not like the mural painting entitled 'Labor,' which the artist, Francis Scott Bradford Jr., placed on the wall behind his desk in the new Milwaukee courthouse. Therefore, he personally purchased mauve colored drapes, which he caused to be hung over the painting, and then placed in front of the drapes a picture of George Washington. There was some objection to this action ... but the judge finally prevailed. The mural painting is of a large woman walking away from the spectators, done in modern style. The weight of opinion, newspaper and otherwise, seems to be in favor of Judge Hedding's treatment of the matter. Susan takes you on a detailed, unique and personal tour of her New York City. Through her camera we see a locals-eye-view of the architecture, graffiti and people that make her city so colorful and fascinating. From her sets on benchwarmers and city people to her perspective on colors and textures within restaurants, lobbies and museums, it’s a cityscape many will never notice. But Susan captures every overlooked detail and transforms them into unforgettable images. It’s a New York you will be glad you visited. 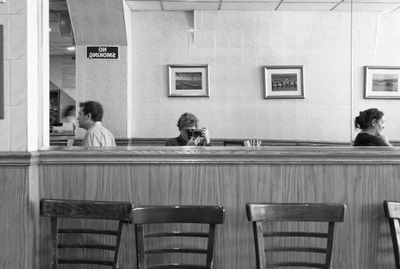 An ordinary moment, documented with care, is a thing of great value. By that measure, Susan Sermoneta may be the richest woman in New York. Would you change anything in your presentation if you knew one of your jurors could draw a perfect bike from memory? That's how Jonathan Koshi spent his waiting time on jury duty. I'm an artist with a taste for technology. My professional craft revolves around the Songbird open-source media player project. I'm the User Experience Architect and a co-founder of the company that makes Songbird, Pioneers of the Inevitable. I'm responsible for the experiences everyone has with our project, from the software, to the website, to our tshirts and stickers. I also illustrate our bird mascot. Outside of work, I'm an avid cyclist (I finally gave up my car last year! ), a live music fan and I volunteer for the Owl Mag, as a photographer. Photography has turned from a hobby to a part-time pre-occupation. Among my other photographic obsessions is one for documenting San Francisco's jukeboxes. Jonathan's Flickr photostream includes, as you might imagine, a lot of bikes. All rights in this image are reserved to him; thanks for his permission to put it in the American Gallery of Juror Art. 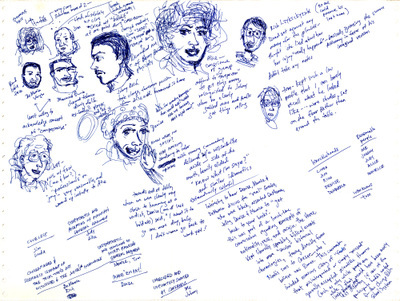 A lot of people would have clicked "back" in exasperation, but Jane instead remembered her husband's intricate jury duty sketches and notes, from a trial in the mid-1990s. [A]s I completed my first jury experience, I wanted to document what I considered to be the most compelling part of the experience, and that was my fellow jurors. More so than the actual civil case itself, or the lawyers' performances, it was the surprising and illuminating behavior of the jury that I was most eager to document. I created the little lists, under which I categorize the jury, so I could better have a framework to understand what I had just been through. As seriously as several of us took the proceedings and our duty, several others were equally disengaged; some entered deliberations completely on the side of the plaintiff, others on the side of the defendant; some seemed open to considering other points of view, and to analyzing their own positions through another lens, while others would not even listen to contrary arguments. It was such a slice of humanity---old, young, white, black, brown, blue collar, professional---and I found the process of throwing us into a room to come to a unified decision simply fascinating. David now lives in Boston, where he is a graphic designer with the architectural firm Goody Clancy. He says "I still have the pages of notes I took in the trial, including my sketches of photographic exhibits, which proved helpful during deliberation when other jurors' perceptions of testimony proved to be a little shaky." It's easy to imagine that the sketches were helpful indeed. All rights in these drawings and text are reserved to David Salvia. Many thanks to him for finding this site and allowing them to be shown here. What a pleasure to discover Elizabeth Perry. "I saw a lot of this staircase and interior," she says of her jury service last year. "In December 2004," says Elizabeth Perry, "I decided to learn to draw by sketching something every day in a small journal." The result is her beautiful blog Woolgathering, where she posts one drawing or watercolor sketch each day. 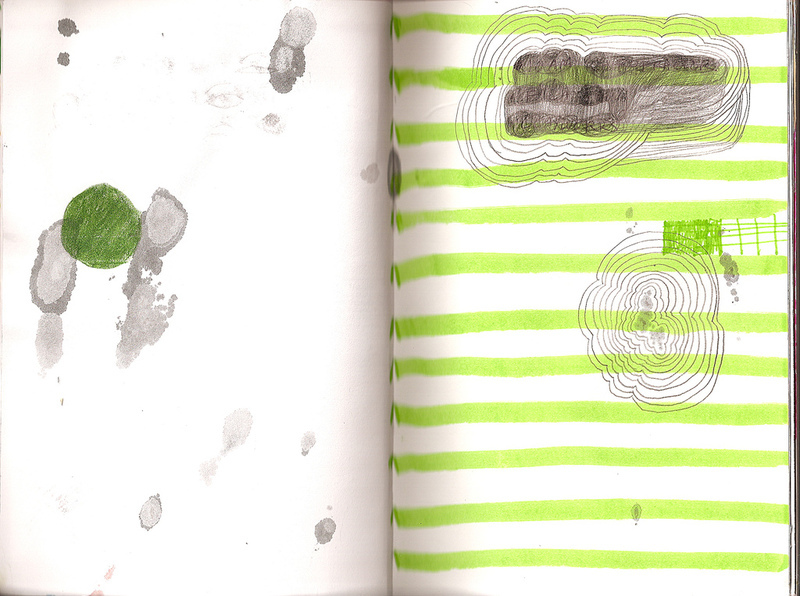 The daily drawing is "a moment to pause and look around," she said one day recently. That's true for the viewer too when you see each drawing in the morning, but as a group, the drawings are more than that. They're a remarkable record of a thoughtful life, for one thing; the days bring humor, beauty, love, and on the day after the Virginia Tech shootings, grief. And they're a remarkable proof that a fleeting moment and a timeless truth are not opposite ends of a linear continuum. It turns out the continuum isn't a line but a circle, and Elizabeth Perry works where the two ends meet. Her drawings have a timelessness that seems to come directly from the evanescence of the moments she has chosen. From October 1, 2006, through June 30, 2007, I plan to visit the public spaces of the Carnegie Museum of Art and the Carnegie Museum of Natural History in Pittsburgh, every day the museums are open. I will draw something in a small sketchbook in response to my experience, and post that drawing to a new sketchblog, www.museumdrawing.com, with short written reflection or response. There are her Pittsburgh drawings, of which this jury duty drawing is an example. They're posted at Flickr and at a group blog called Clusterflock. By training she is a writer, not an artist; she has written a children's book, Think Cool Thoughts , together with nonfiction and short stories. She has other projects ranging from interactive web/video student materials to knitting ("I do make up my own patterns.") Somewhere in the mix are a job and children, and I have no idea how she fits all this together. She describes her work in a steady voice that seems perfectly matched to her drawings, in a short video here. Many thanks to Elizabeth Perry not only for allowing her drawing to be used here, but for posting her Flickr work under a Creative Commons license that lets others use it too. The American Gallery of Juror Art is proud to welcome Christine Buckton Tillman. Christine Buckton Tillman is an artist in Baltimore, and a faculty member and Exhibitions Educator at the the Park School there. She works in sculpture, drawing, and projection. The drawings in Christine's on-line portfolio are fanciful, fun, and mysterious: flowers in rich layered colors fit into the squares of graph paper, indigo watercolor universes of constellations, and loops and garlands that look like party decor. She says her work draws on "images and objects in which I see an inner dichotomy -- objects that are at the same time happy and sad, full of joy, and utterly hollow. These objects lose something in translation," she continues. "The phenomena of a rainbow becomes trite and cliché on the cover of a notebook." Christine's jury-duty drawings are notebook doodles, but they have a lyrical quality that hints of her "real" work. She says the love note on the second drawing is really from her husband. She posted the drawings in the "Drawing: We Do It Every Day" pool on Flickr, which contains spontaneous daily sketches from over 750 pool members. All rights in these drawings are reserved to Christine Buckton Tillman; thanks to her for cheerfully agreeing to let them be shown here. At Austin Criminal Defense Lawyer, Jamie Spencer points to his former teacher Wayne Schiess's excellent legal writing blog, Legalwriting.net, and his several recent posts on the challenge of making jury instructions clearer. You can't talk to a jury unless you've made your way through discovery, and the new federal E-discovery cases and amendments are challenging all of us. At Civil Procedure Prof Blog, the "Thursday interview" is with Hon. Lee Rosenthal of the United States District Court for the Southern District of Texas, who is introduced as "the architect of the electronic discovery amendments to the Federal Rules of Civil Procedure," and graciously protests that she is not the only one. Jennifer Lopez showed up for jury duty in Beverly Hills, looking great. If you ever decide to keep yourself current on jury matters, be aware that when Jennifer Lopez has jury duty, it's going to seriously clog up your news feeds. Charles Dickens, wonderfully, quoted on voir dire at Blawgletter: "A good, contented, well-breakfasted juryman is a capital thing to get hold of. Discontented or hungry jurymen, my dear sir, always find for the plaintiff." For many trial lawyers, the great challenge is to step outside our own perspective and view the trial as a juror does. Here's a suggestion for both a starter exercise and a lifelong habit: start by taking the challenge literally. What is the jurors' view? From where they're sitting, what can they see? 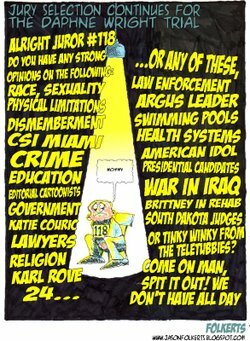 In South Dakota last week, a trial lawyer asked that question, and a cartoonist was startled to see his cartoon marked as Exhibit A. It's an awful trial; Ms. Wright, who is deaf, is accused of killing another woman and dismembering her with a chainsaw, because she was jealous of the woman's friendship with Ms. Wright's own girlfriend. Against that grim background, it must have been a welcome moment to at least some observers when the focus of the trial suddenly became Jason Folkerts's cartoon. Apparently one of the sign language interpreters had the cartoon attached to her notebook. 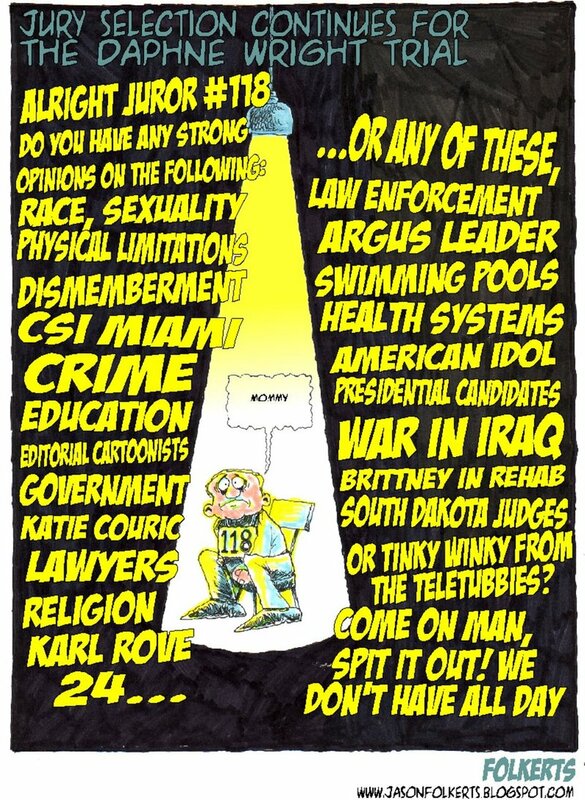 Defense counsel, public defender Jeff Larson, saw the cartoon, and was concerned that jurors might have seen it too. Thanks to Jason Folkerts for permission to reprint his cartoon. If by any chance you're counting references in this blog to Tinky Winky from the Teletubbies, this cartoon is number two; the first one is here. The American Gallery of Juror Art doubled its collection this week with David Namisato's sketches from a jury-duty waiting room. 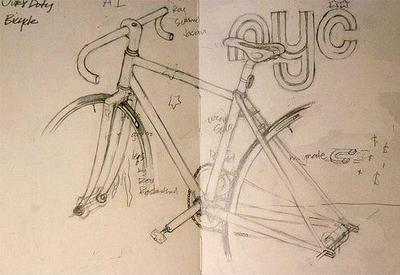 David Namisato describes himself simply: "I am an illustrator. I like donuts and pie." David is an illustrator who lives in Toronto. His online portfolio shows his sophisticated comic-book drawing style and suggests the years he spent "in a small squid-fishing, and apple-farming town" in Japan. 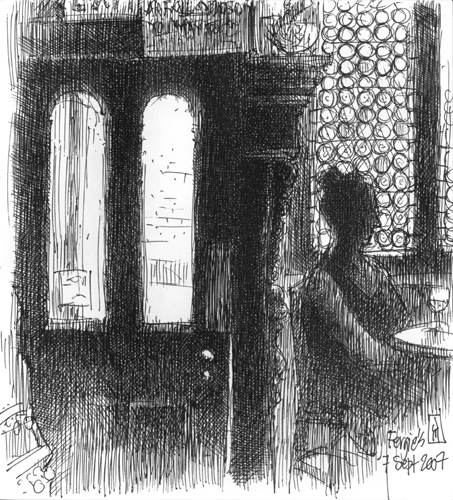 There are more drawings like that in his Daily Doodles blog, but the drawings I love there are the ones like these: simple impromptu ink sketches of people and places. David combined these three sketches, of potential jurors waiting to be called, into a single image for the American Gallery of Juror Art. 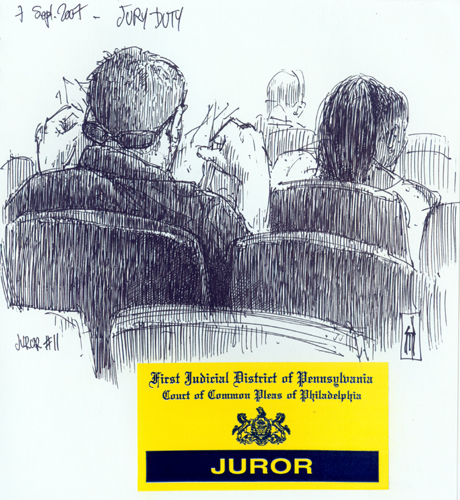 You can find more of his jury-duty drawings if you search "jury" in his Flickr photos. He never got picked for a jury, so he had plenty of time to draw. All rights in these drawings are reserved to David Namisato. Many thanks to him for his willingness to show them here. 1. 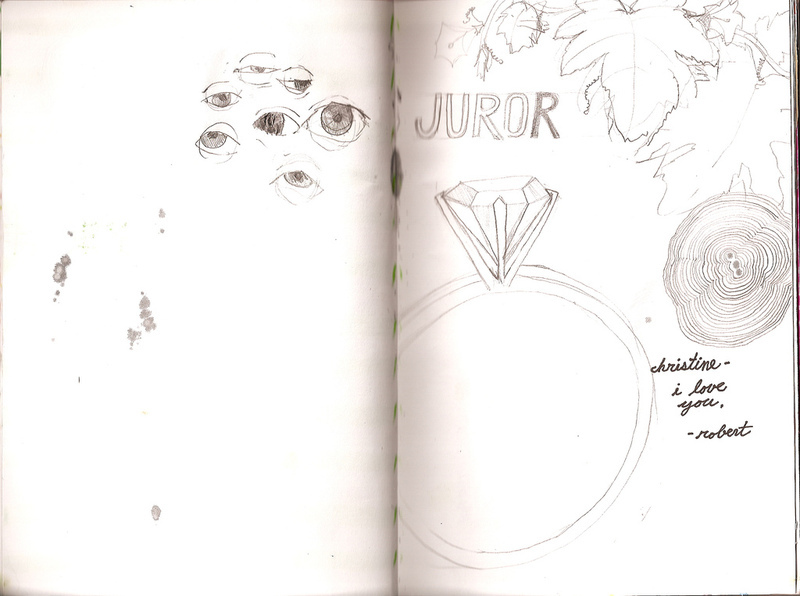 Preview of next week: jurors and beauty. Yesterday, British researchers announced they had found that volunteer "jurors" presented with identical facts were more likely to acquit attractive defendants than ugly ones. The story spread fast on the news feeds, suggesting that somebody was surprised. We shouldn't be, as I'll discuss next week. 2. Recap of last week. Eric Turkewitz at New York Personal Injury Law Blog has been spending Fridays reviewing the past week's litigation-related blog posts. He's done a lot of work for us in these, and I'm not just saying that because I'm in it this week. 3. More on neurolaw. For those interested in Jeffrey Rosen's neurolaw article, discussed here recently, or in the way jurors process information generally, Prof. Adam Kolber has a Neuroethics & Law Blog devoted to the subject. There is something for trial lawyers in almost every post here. 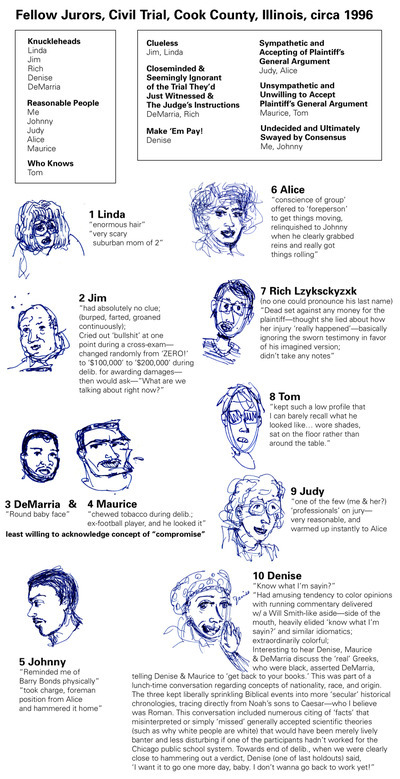 This post inaugurates the American Gallery of Juror Art, the first in the nation of its kind so far as I know, showcasing art done by actual jurors while they were actually on jury duty. Mike Rohde, a visual designer who, like me, lives in Milwaukee, has kindly agreed to allow his drawing to be the inaugural work in the American Gallery of Juror Art. Mike is also a blogger, it turns out; he blogs "about design, writing, mobile computing, technology, travel, cycling, books, music and other stuff" at Rohdesign Weblog. It's really good. Mike describes his drawing as "A combo of thoughts while reading Keith Ferrazzi's Never Eat Alone book on the left; images from my short stint at Milwaukee County Jury pool on the right." 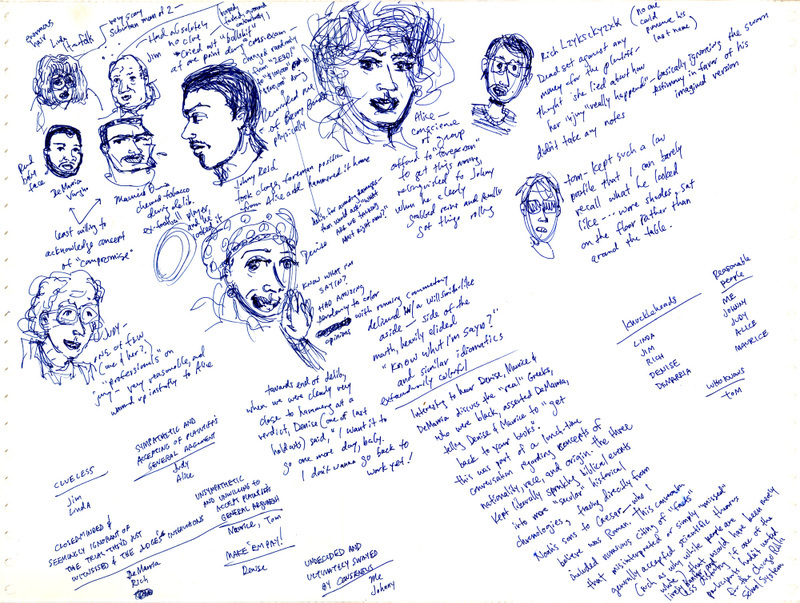 The drawing, from his Moleskine notebook, is on Flickr, and all rights are reserved to Mike. Watch the sidebar for new contributions to the American Gallery of Juror Art.